One of the biggest questions that arise when researching virtual education is, “What social opportunities do you offer?” We are proud to offer the following clubs and activities at the High School level. Student Council: Student Council is offered to students in grades 9 – 12. 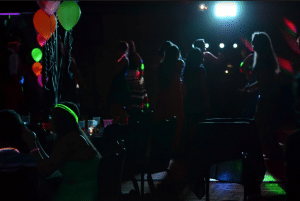 Student Council members are responsible for activities such as, but not limited to: Theme week, community service project, school outings, talent shows, prom, and movie nights. Art and Photography Club: This club is for anyone who is interested in pursuing a career in the arts, or just looking to expand on a hobby! This club meets once a month. 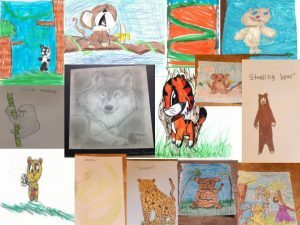 Themes will be established each month for members to explore and share their work at the monthly meetings. SMART Team: This is a collaborative, research based team. We are looking for people that are team players, but can also work well alone. You do not need to be an expert in science, you only need to have an interest in science to be part of our team. Our team utilizes a modeling software called JMOL to create a virtual model of a protein in addition to writing science abstracts. The SMART Team meets twice a week between September-April. We meet face to face 2-4 times in either Mequon or Milwaukee. These dates will be published in early September, and these mandatory meetings are typically on a Saturday. There will be homework and research done outside of meeting times. Our culminating project is a poster presentation in Milwaukee. You will receive ½ credit for the year when you attend all virtual and face to face meetings. National Honor Society: This is an invitation only club. Selection to membership is based on four criteria: scholarship, leadership, service, and character. 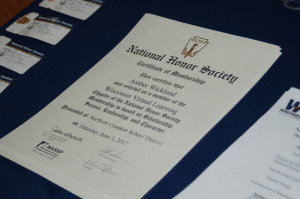 The National Honor Society requires some sort of service to the community, school, or other organizations. The time spent working on these projects contributes towards the monthly service hour requirement. Our school community service has been established to be tutoring hours for WVL students. Each NHS member will be required to complete 5 hours each semester and to document these hours. The meetings for NHS are mandatory. We also offer National Junior Honor Society making this an opportunity for ALL high school students with a 3.0 or higher GPA. Face-to-Face Outings: We are proud to offer in person gatherings throughout the state of Wisconsin for all WVL students. 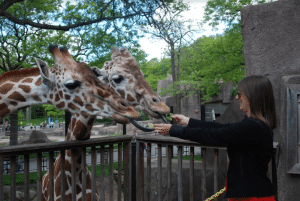 Outings in the past have included but not limited to: Milwaukee Art Museum, Discovery World, Brewer’s Weather Day, Cave of the Mounds, Lambeau Field, Bay Beach, Milwaukee County Zoo, Tour of the Capitol, and much more. Prom: Every year WVL teams up with EAchieve to offer our students a traditional prom experience. Prom is held at the Kalahari Resort in the Wisconsin Dells at the end of April or beginning of May. Make sure to sign up and bring your dancing shoes! Gaming Club: This club is a favorite of many. Come chat with other gamers in a supervised setting to learn all the tricks and trades of your favorite games. Students may also enjoy friendly gaming tournaments. Graduation: Wisconsin Virtual Learning values the hard work and dedication of all of its students. That is why we hold a formal graduation ceremony for our seniors every Spring. 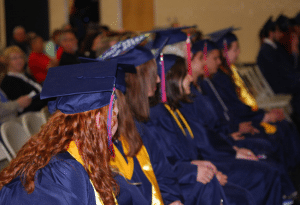 Graduation is held at the Northern Ozaukee School District. Interested in learning more about enrolling your high school student at WVL? Request information and connect with our admissions team today!